Born this day in 1894. "Within the hierarchy of the little men there is no man who can outlittle the minor executive in a large corporation who treats his authority as he treats a tight suit. In a tight suit, he is afraid to make a move. With his authority the minor executive takes the same precaution. There are thousands of these negative men in the places where minor executives conceal themselves in the labyrinths of the big corporations. They use the clam philosophy. If a clam never sticks its head out it is never overtaken by trouble. " Illustration of Allen by Al Hirschfeld, as if you couldn't tell. Hat tip to David Pomerantz! Thanks, David! Is New England a hotbed of cartoon talent or what? From today's Rochester Times, here's a scan (since I couldn't find it online) of National Cartoonists Society nominees for Best Newspaper Panel: Mark Parisi (Massachusetts), Stephanie Piro (New Hampshire) and Wiley Miller (Maine). Judging by their attire, I would guess this was taken on Saturday, May 26, 2012 at the formal Reuben Awards dinner. Congratulations to Mark Parisi upon his win. A stylish short documentary about the man and his fans. Daniel Clowes spent a very special night at Meltdown Comics on April 5th, 2012. 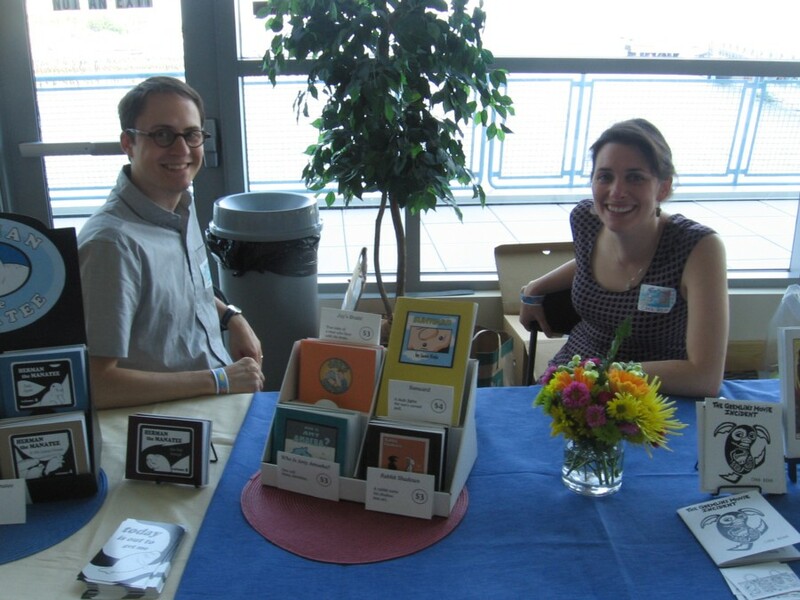 Carlos, a collector of Clowes' work, and his fiance Timony were living the experience as a dream come true. 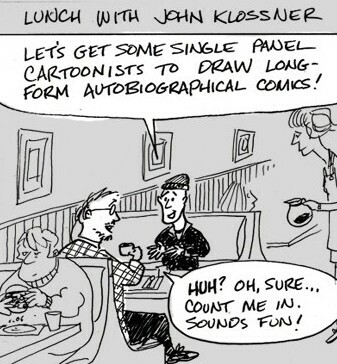 Follow them through this short documentary about the master cartoonist. Executive produced by: Jessica Gao and Gaston D-L. for Meltdown2.0, LLC. 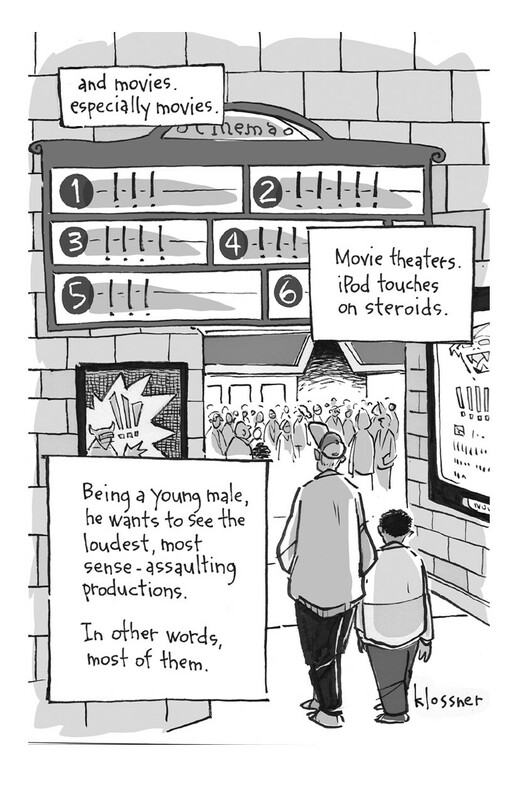 From December 2006: an outtake from the documentary CARTOON COLLEGE. 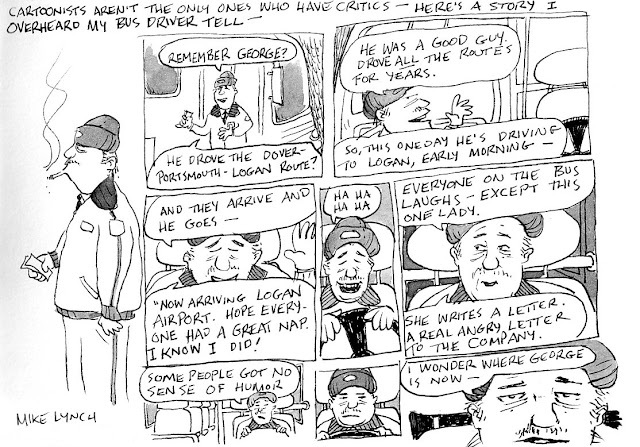 Art Spiegelman talks about the complexities of telling stories with comics. 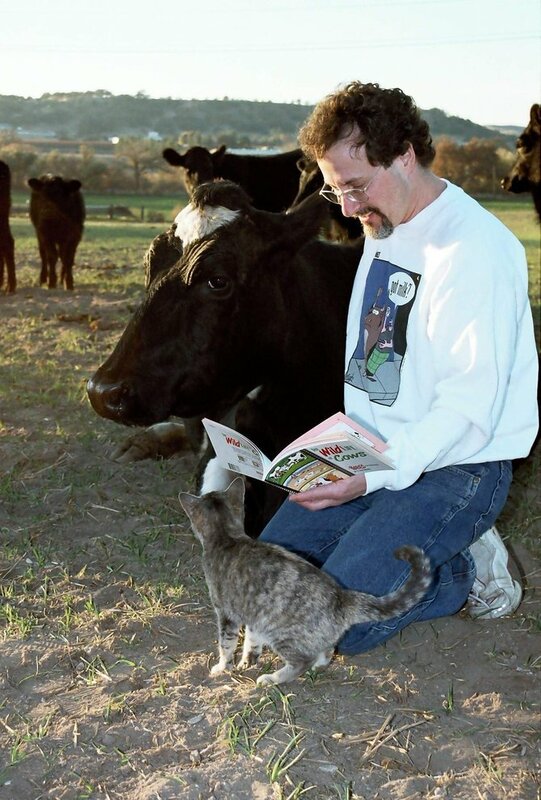 From CBS This Morning: Tom Batiuk shows reporter Seth Doane his Northeastern Ohio environs where he sets his FUNKY WINKERBEAN comic strip. 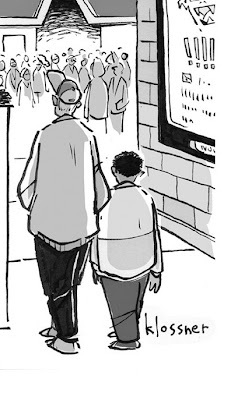 They talk about the current storyline of a gay couple wanting to go to the high school prom, as well as older controversial stories like a pregnant teen and the Lisa's cancer story, for which Batiuk was shortlisted for a Pulitzer. Related: new from Black Squirrel Press: THE COMPLETE FUNKY WINKEREAN. 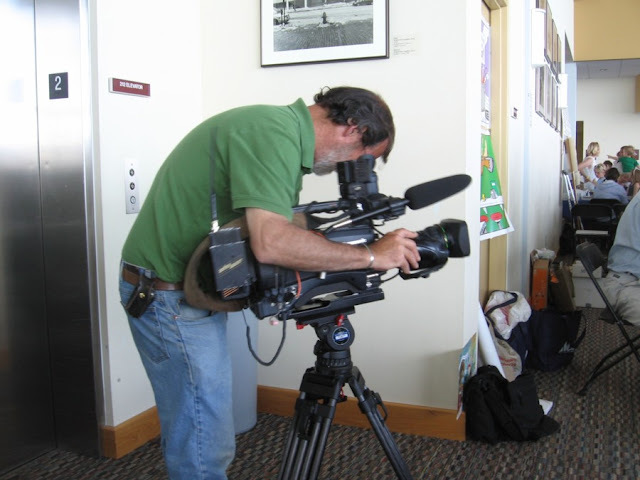 From May 2012: Tom Batiuk is interviewed in this "My Ohio" segment by WEWS TV's Leon Bibb. From 2007: a career-spanning interview with Mr. Batiuk. 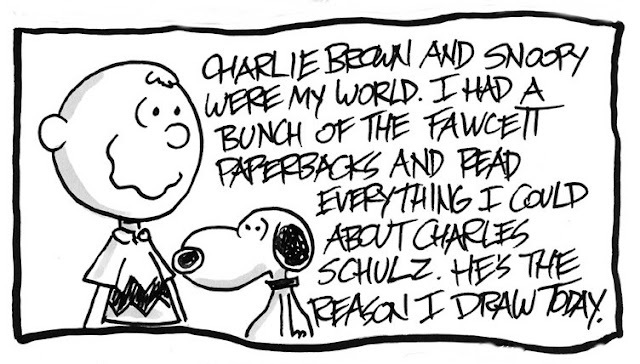 Cartoonists aren't the only ones who have critics. Here's a story I overheard my bus driver tell. Jim Unger, creator of the long running newspaper panel HERMAN, died in his sleep on May 29, 2012, after a long illness in Saanich, British Columbia. He was 75. Funeral arrangements have not yet been made. In lieu of flowers and cards, Unger¹s family has asked for donations to the Heart and Stroke Foundation. "If, like me, you're feeling down about Jim Unger's passing, go pick up a Herman book. 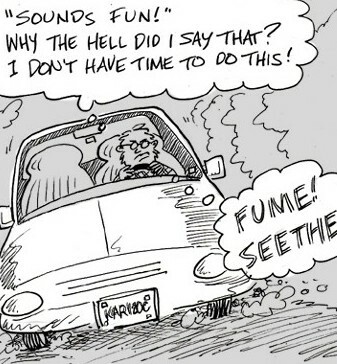 I guarantee you'll start giggling at the first cartoon. I think that's how Jim would want to be remembered." Ottawa Citizen obituary by Clare Clancy here. Bado has a remembrance at his blog. 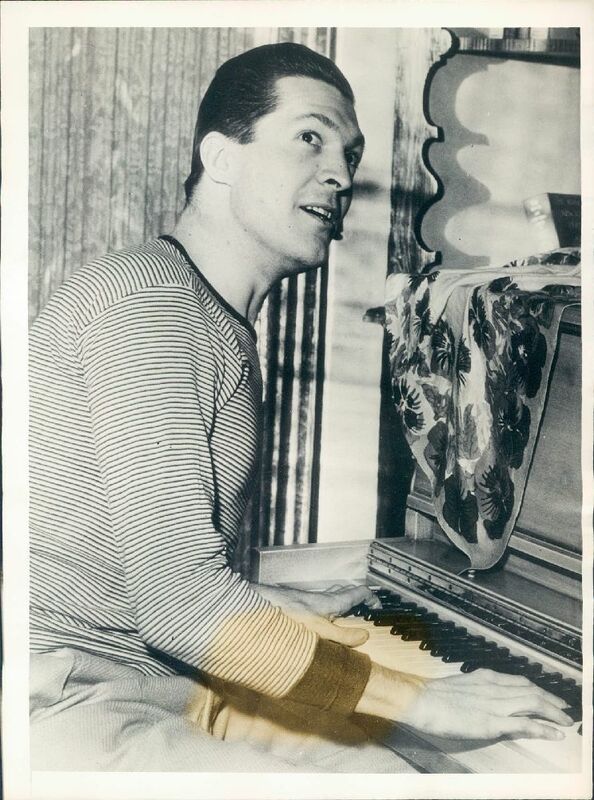 Bill Finger (1914-1974) was one of those uncredited Golden Age comics writers. He worked anonymously on Batman with Bob Kane. He created the Batman we know today -- the costume, the Sherlock Homes-style detective, the Doc Savage-like scientist. It was 1938 in the then-new post-Superman age. Action Comics #1 had created a sudden boom in superhero comics. Content was needed. New superheroes were welcome. Bob Kane had sketched an idea for "The Batman" (in a red suit!) and called his friend Bill to brainstorm about it. So, even though pretty much every Batman story had a "by Bob Kane" credit, that was not true. Marc Tyler Nobleman corrects this. 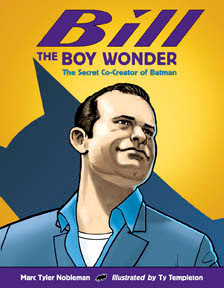 The prolific author has a new book out, with illustrations by Ty Templeton, titled BILL THE BOY WONDER: THE SECRET CO-CREATOR OF BATMAN. Like Marc's previous BOYS OF STEEL, BILL THE BOY WONDER sets out to give credit where credit's due. Bill Finger, decades after his death, is on the map. 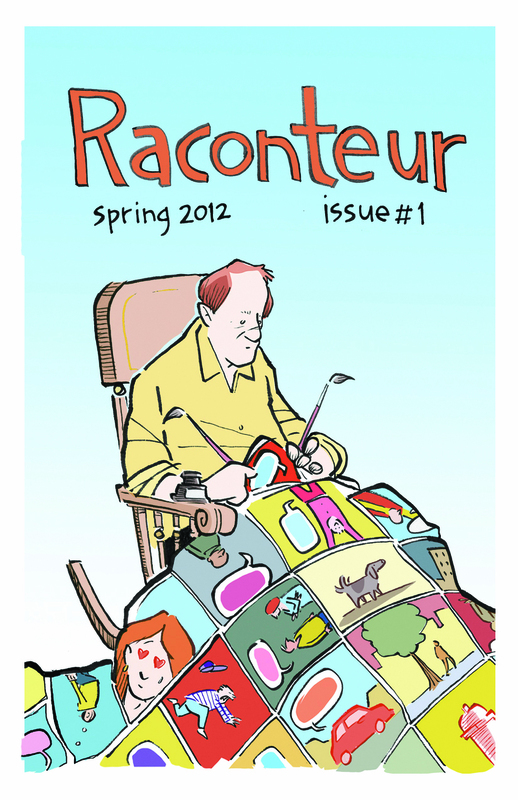 SNEAK PEEK: Here are a few panels from RACONTEUR, the new comic book I did with some other friends of mine. I'm selling it, via Paypal. 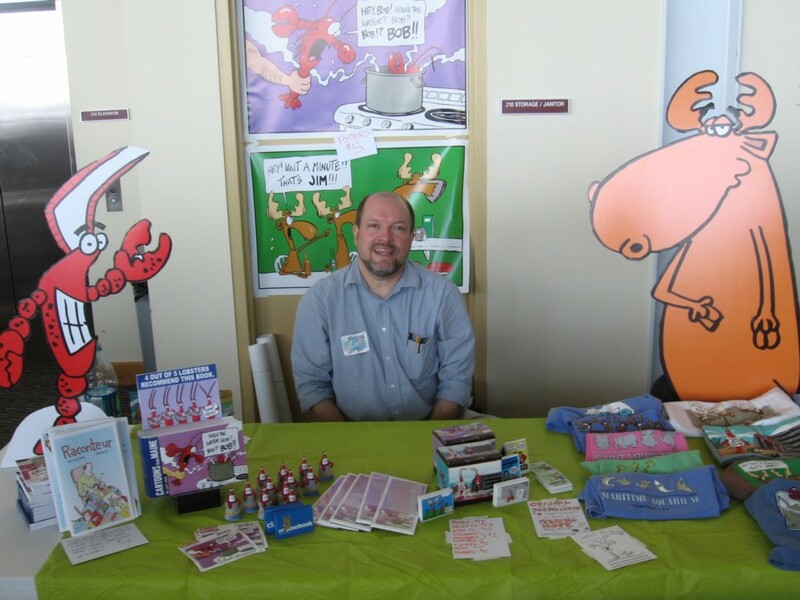 Mark Anderson shares his toys! 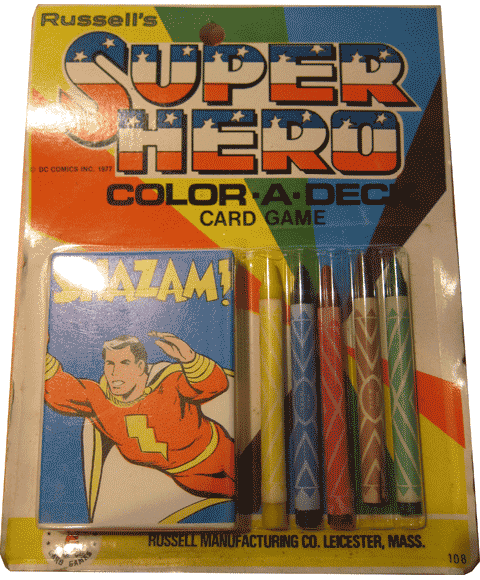 Here's an amazing collection of superhero coloring books from the past couple of decades, culled from many eBay auctions. 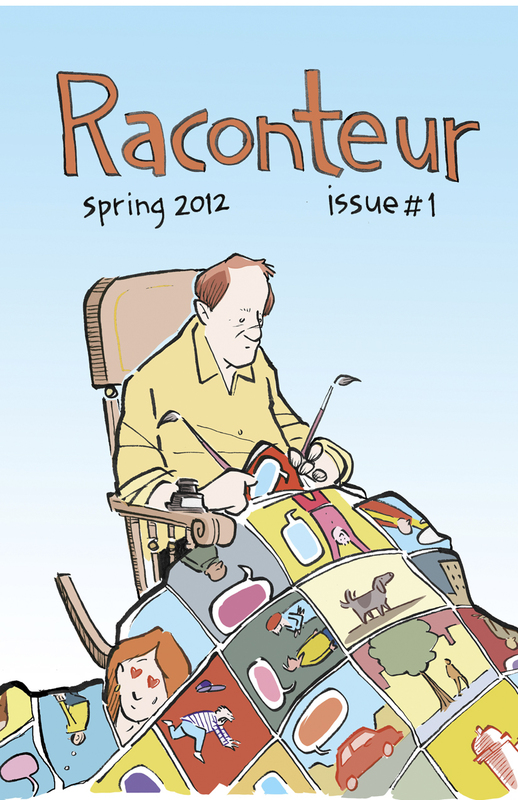 And if you click on the cover image then you can get a complete PDF of the (uncolored) interior. Host of Fear No ART, Elysabeth Alfano, sits down with acclaimed graphic novelist, Chris Ware, in his home library for an understanding of this influential artist. How many times has a cartoonist not only carried a gun, but had that weapon registered at the address of the magazine he sells his cartoons to? 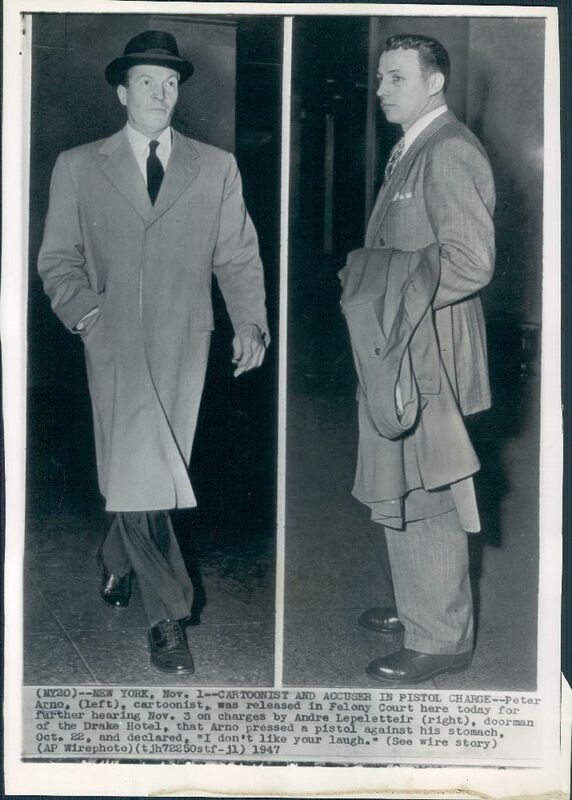 Above: NEW YORK, Nov. 1, 1947: CARTOONIST AND ACCUSER IN PISTOL CHARGE -- Peter Arno (left), cartoonist, was released in Felony Court here today for further hearing Nov. 3 on charges by Andre Lepeletteir (right) doorman of the Drake Hotel, that Arno pressed a pistol in his stomach, Oct. 22, and declared, "I don't like your laugh." According to The Evening Independent, November 1, 1947, Lepeletteir offered to get Arno a cab and Arno was reportedly to have replied, "I don't like your face and you're not a good American either." Police said that Arno had a pistol permit and that the permit bears the address of the New Yorker magazine which publishes Arno's cartoons. 2 March 1948, pg. 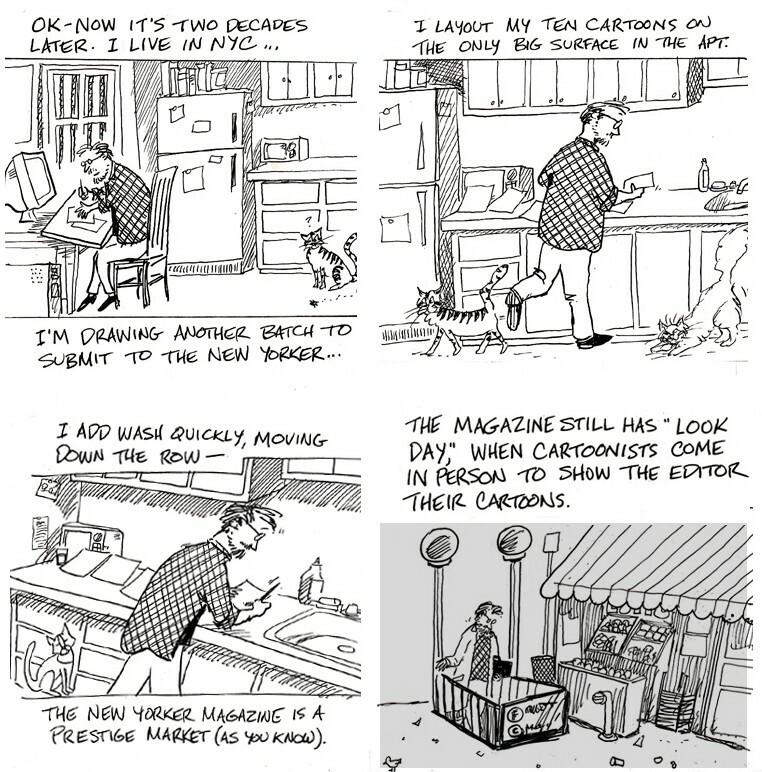 21, "Peter Arno Case Dropped; Cartoonist Freed as Doorman Fails to Press Pistol Charge"
One day we will get the full story, when Michael Maslin's Peter Arno bio ("Mad At Something – The Life & Times of The New Yorker’s Peter Arno") is published. In the meantime, he's posted an excerpt here. 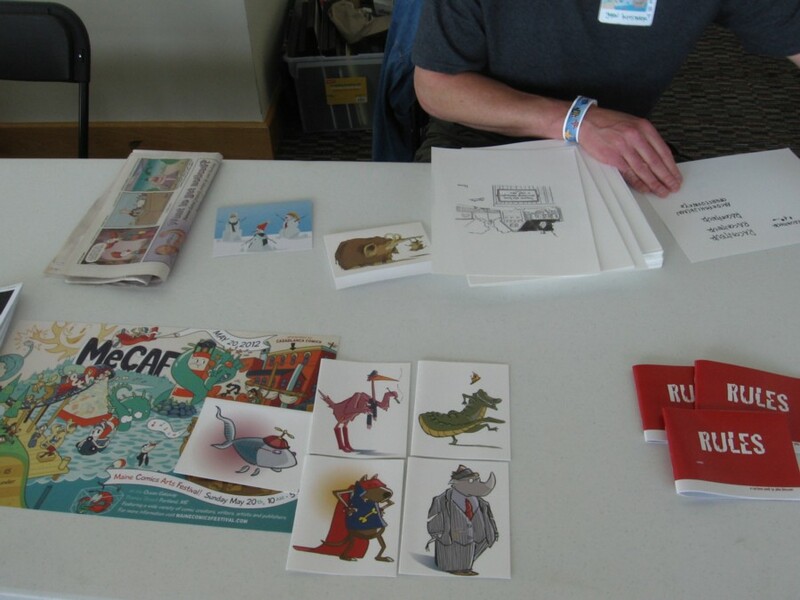 Here are some more photos of cartoonists in no particular order. Many of these were new to me. 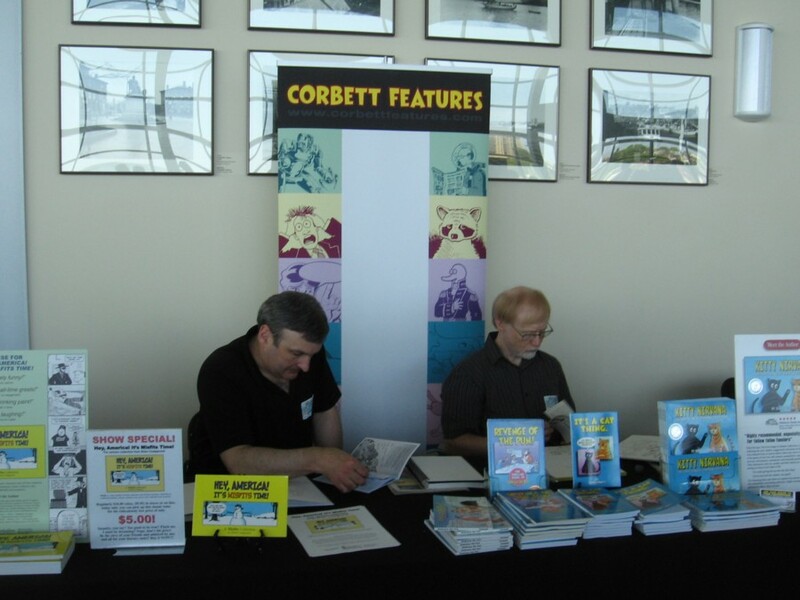 This is part four of photos of cartoonists from over the years. 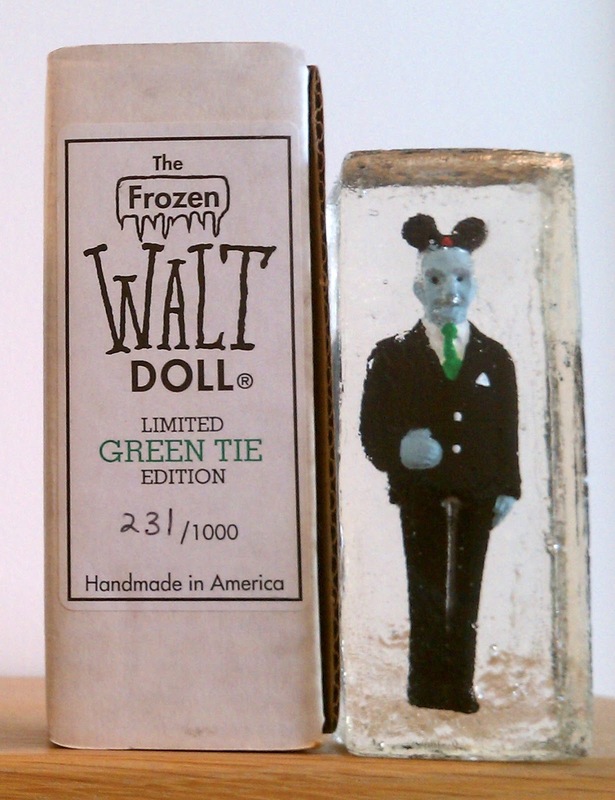 A Walt Disney doll frozen in an ice cube?!?! Sherm Cohen has details here. 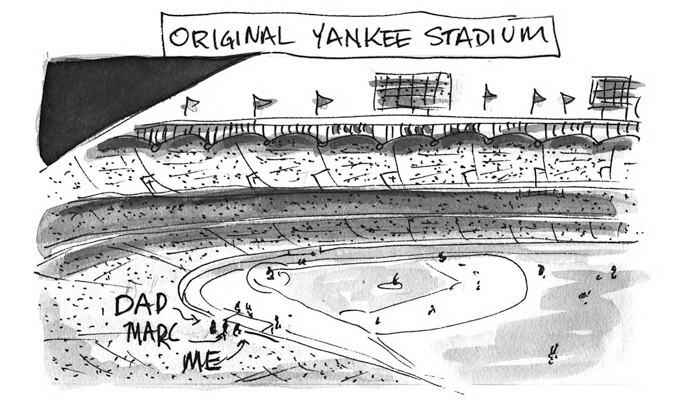 Leigh Rubin: If My Wife Says My Cartoon Is "'Sick,' Then I Know I Have a Winner." 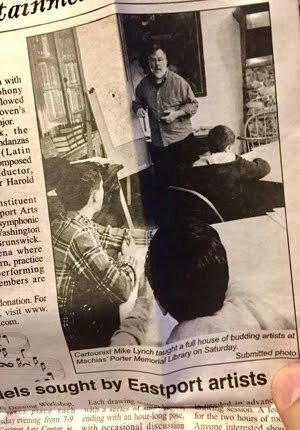 Cartoonist Leigh Rubin, who draws the RUBES newspaper cartoon panel, is interviewed in the Modesto Bee. 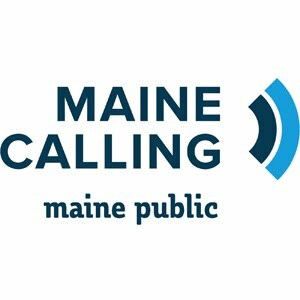 Who's your sounding board? And do most of the ideas you come up with end up in "Rubes," or do you toss away two for every one we see? I do have a growing pile of random concepts that never quite jelled. To become an official "Rubes" cartoon, a drawing must pass a battery of strict tests. In addition, my wife must give it the final approval. If she says it's "sick," then I know I have a winner. Animator Gene Deitch talks about the long process of making the WHERE THE WILD THINGS ARE animated film. The production was long and arduous, five years of on-&-off start & stop, with Maurice demanding change after change, often contradictory. I still have boxes of letters, memos, notes, sketches, scribbled ideas, rejections, arguments, changes, changes, changes. Was it worth it? Well, yes, it’s my all-time best-selling film, and the royalties soothe my memories of pain. 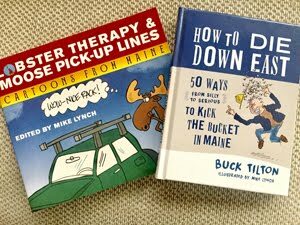 I’m posting here a few random samples, which can only give you a rough idea of the ups and downs and general angst we endured. and an unseen 1984 film of Deitch and Maurice Sendak talking about their IN THE NIGHT KITCHEN film. Go read the entire tale here. You want a copy? You got it! 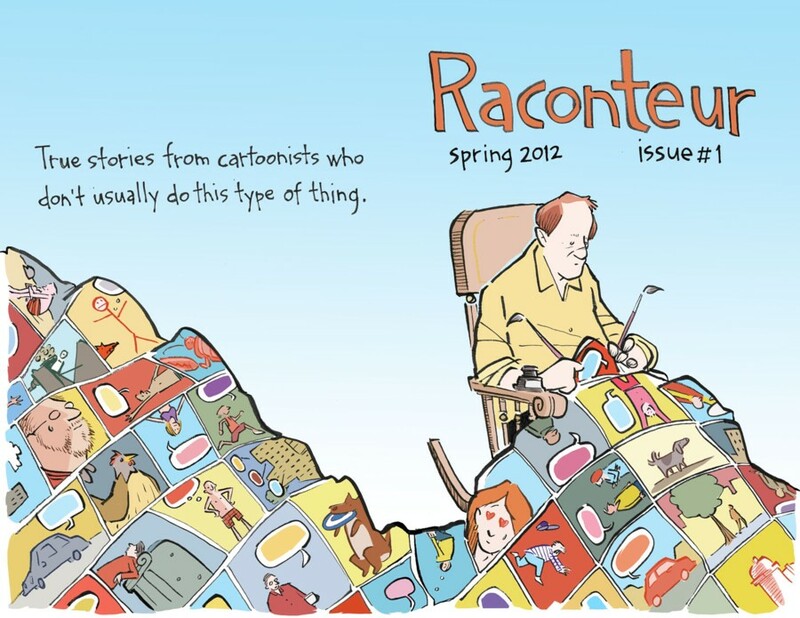 A new 20 page comic by four cartoonists "who usually don't do this sort of thing." Cartoonists who are known for drawing single panel cartoons for The New Yorker, Down East Magazine, Reader's Digest and The Wall Street Journal, draw autobiographical comic stories. 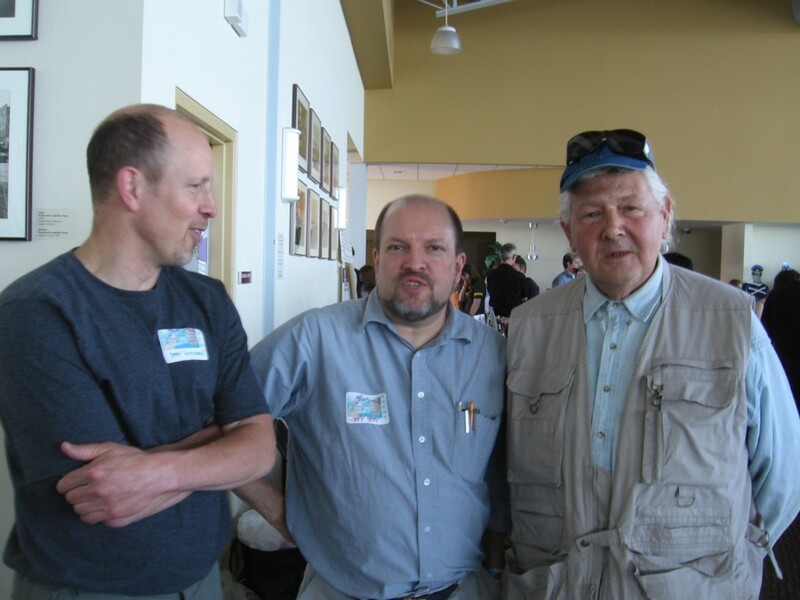 Some of the best cartoonists today (and great friends): John Klossner, Jeff Pert and the one and only Bill Woodman. 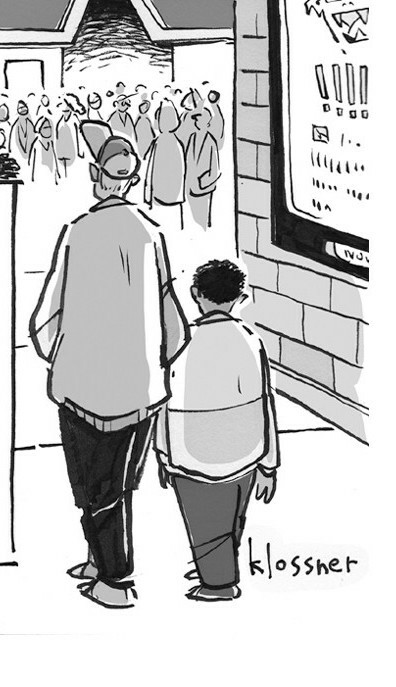 Just like comics nerds: a beautiful day outside, the kinda day Mom says to go out and play. 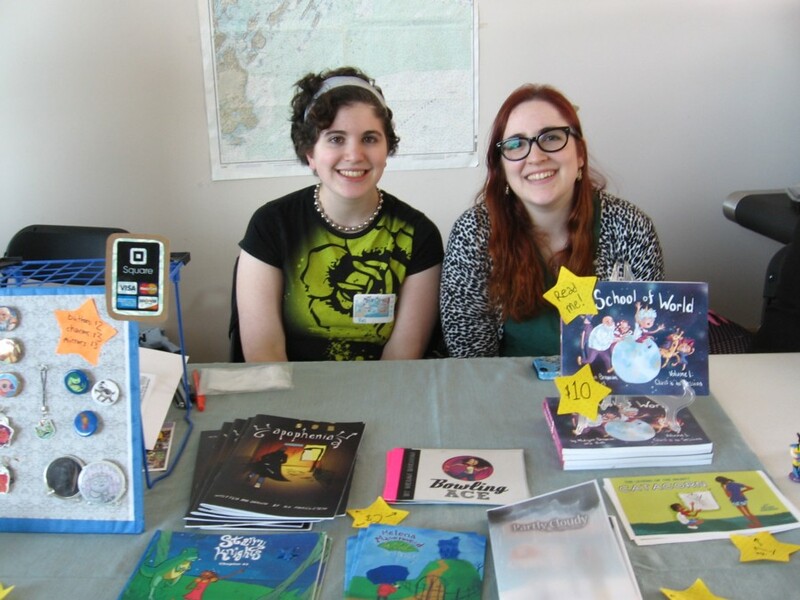 On Sunday, hundreds of people showed up to hang out inside the Ocean Gateway complex on Casco Bay -- with 100 creators displaying their wares, and hundreds more kids, parents, teens, cosplay fans, and curiosity seekers checking out the merchandise -- all sharing their love of comics at the fourth Maine Comics Arts Festival. Jason Viola and Cara Bean. The guy at the next table: Maine's Maddest Cartoonist: my pal Jeff Pert. 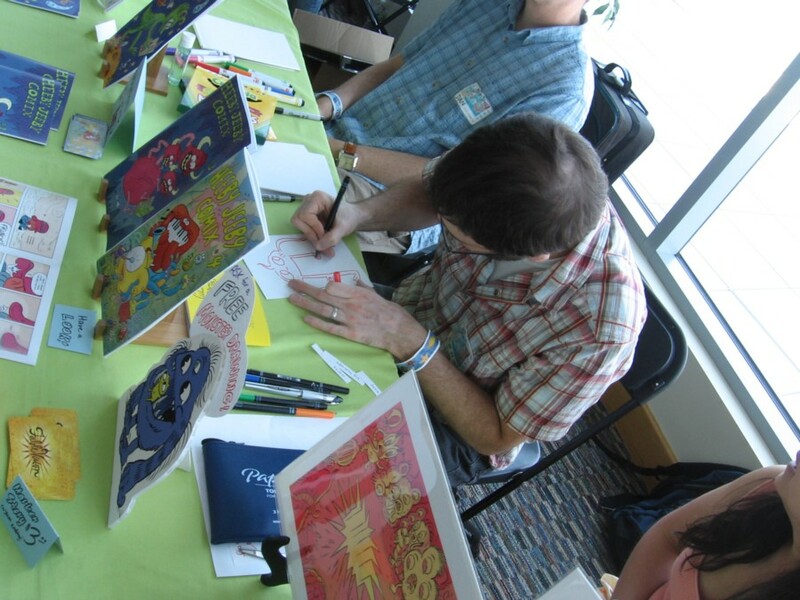 Fellas, could you stop drawing in your sketchbooks and say hello? 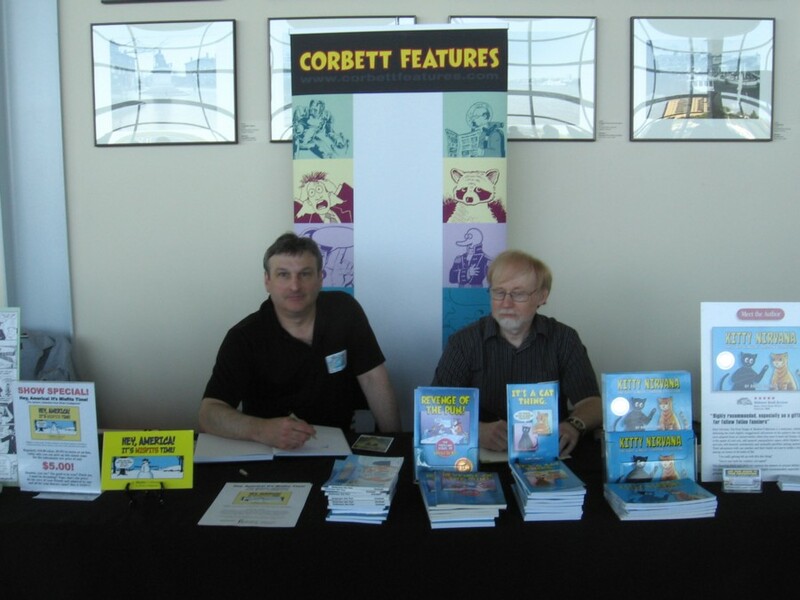 Corbett Features: Brian Codagnone and Barry Corbett. My friend Alex Cox represented the Comic Book Legal Defense Fund. 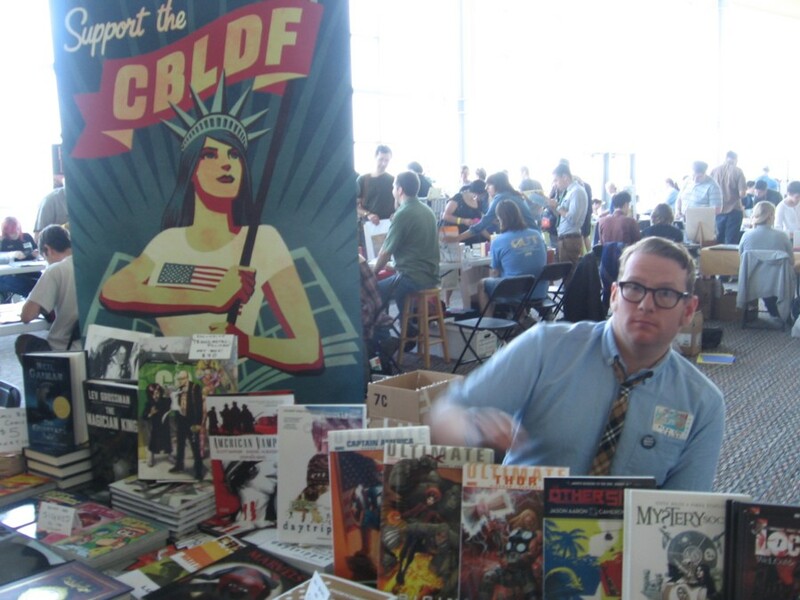 Alex is the Deputy Director of the CBLDF. 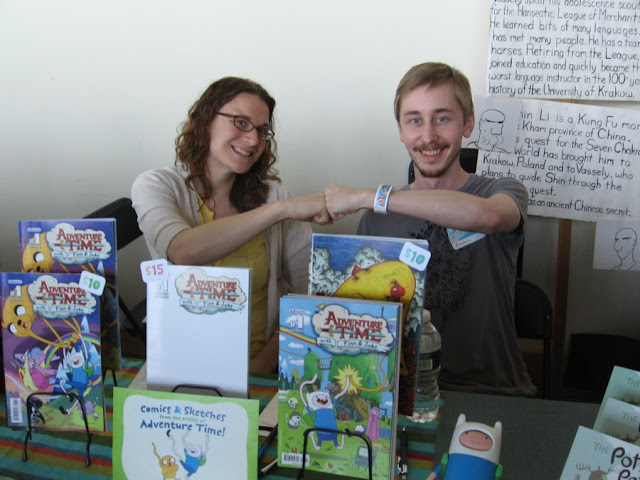 Comics power couple: Shelli Paroline and Braden Lamb. 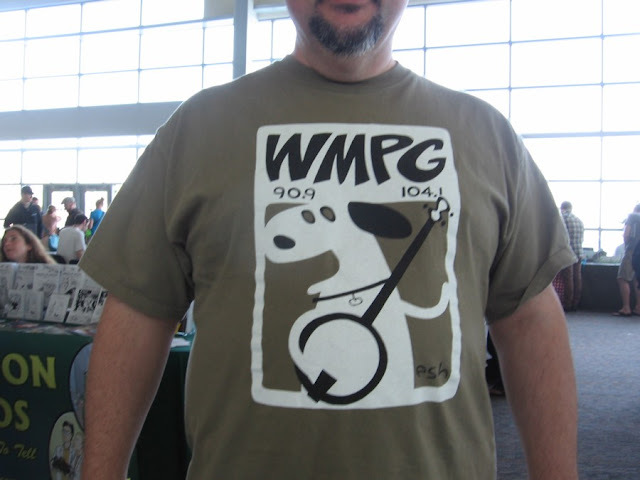 Love this WPMG logo dog! 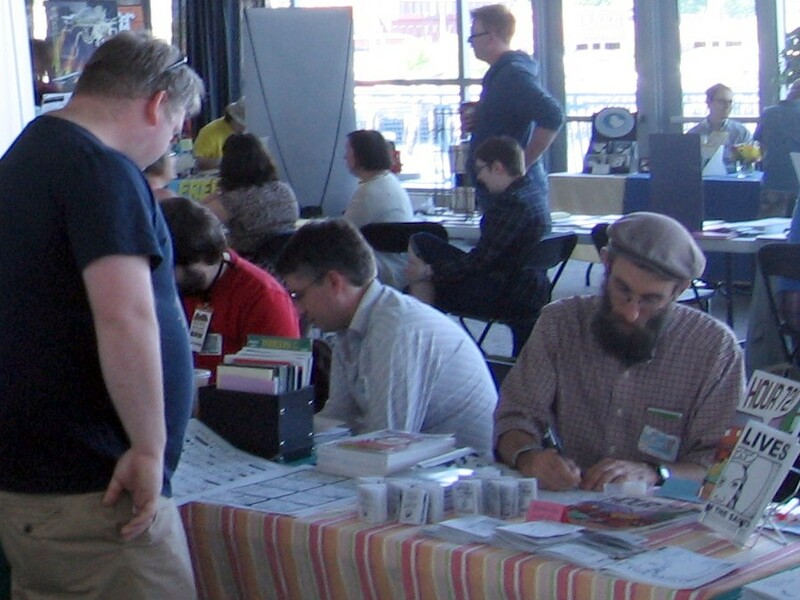 Above: Bob Flynn, of Heeby Jeeby Comics, draws! 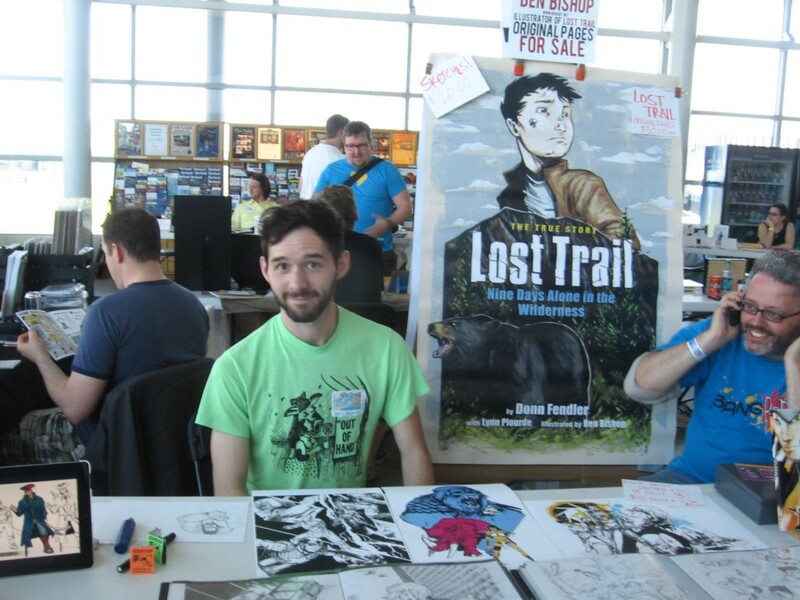 Ben Bishop promotes his new LOST TRAIL book. Marek Bennett signs books with the Trees and Hills Group. 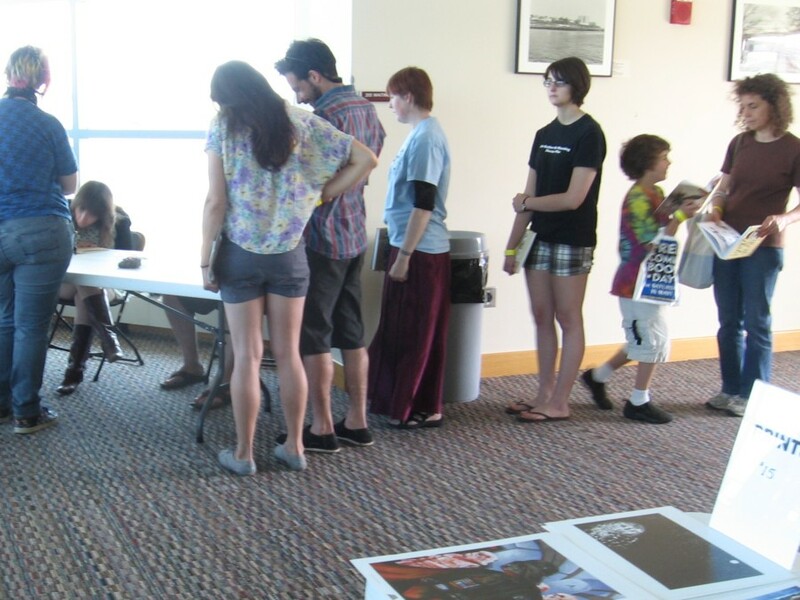 The line of people for Kate Beaton went out the door. 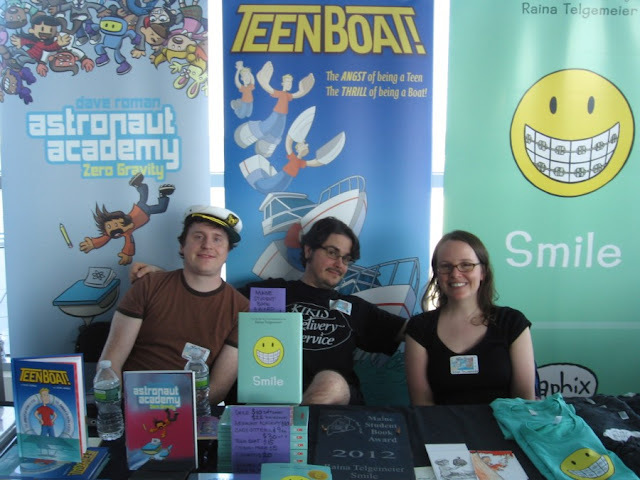 John Green, Dave Roman and Raina Telegemeier. 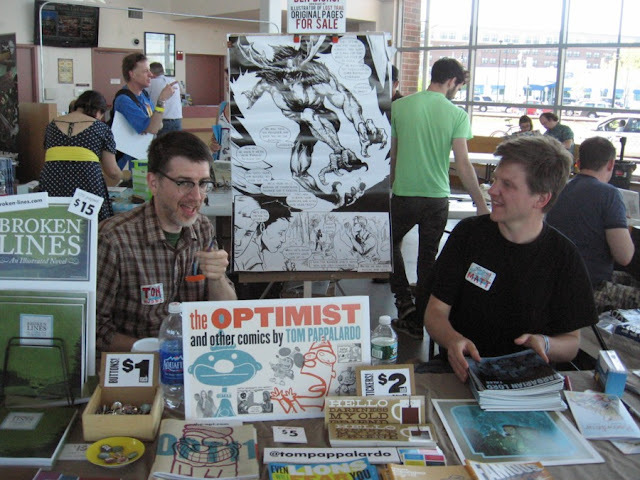 Tom Pappalardo and Matt Smith. 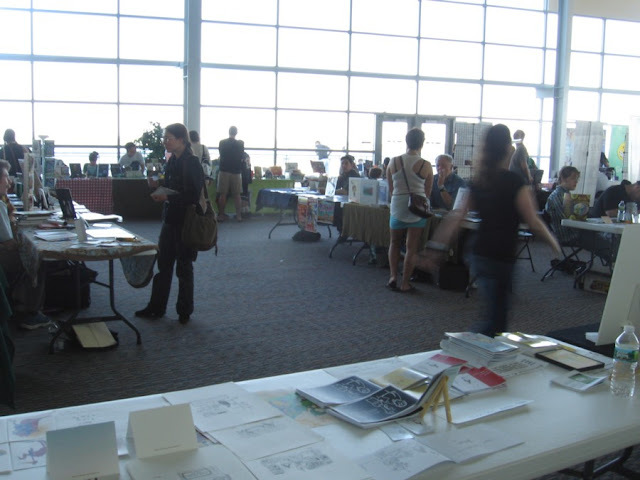 Above: the way my table looked. 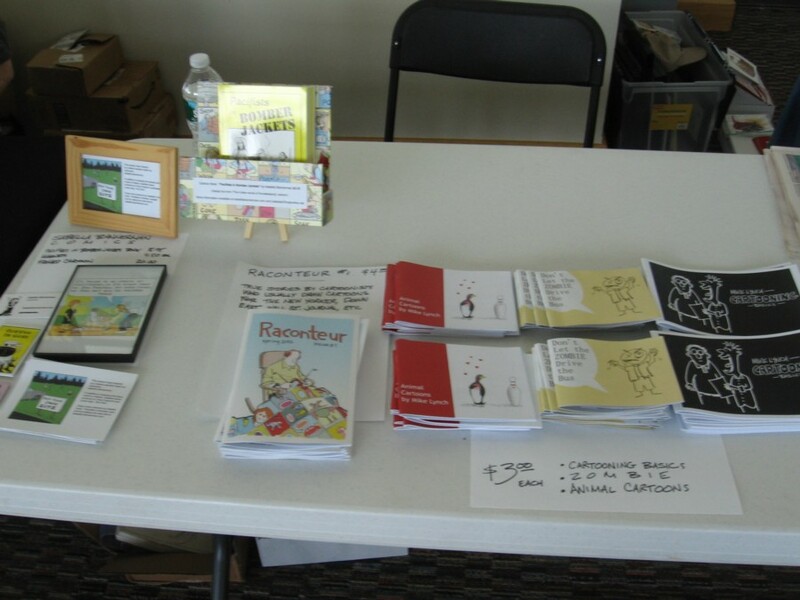 I had some books and magnets from Isabella Bannerman to sell, as well as comics and minis of my own. 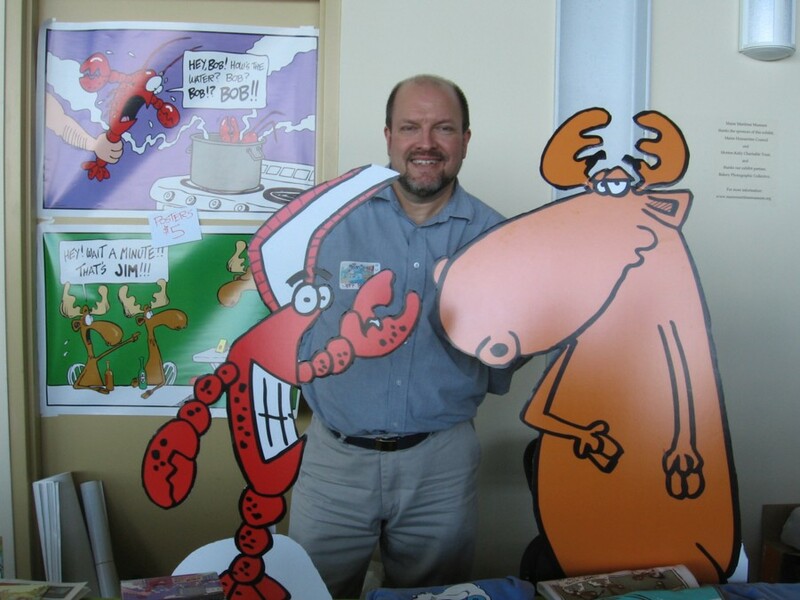 And, of course, a tip of the hat to Rick Lowell for producing this terrific event!